Every term at The Children’s House we send out feedback questionnaires to our parents. Some of the parents reported back that they would like to understand a little more about how we do literacy in our Montessori settings. As a result I held a literacy information session last term for all those who were interested. It was an interesting session when I was able to demonstrate many of the points I make below (and many more) using the activities in our environments. Literacy is a key area, not only does it have its’ own section in our environments, but we consider it in all areas of learning. Reading, writing, speaking and listening are all important life skills. We use our literacy skills to communicate our thoughts about everything. From expressing our needs, insecurities and pleasures to giving explanations of scientific and mathematical concepts; well the children at The Children’s House do, where questioning, expressing yourself and experimenting with language are all encouraged. Montessori uses an indirect approach, focusing on the skills needed to be literate rather than ‘teaching’ writing and letters before the child is ready. The skills needed include fine motor skills for instance the pincer grip, hand eye co-ordination and dexterity. Tracking skills, concentration, listening skills, visual and auditory discrimination and sequencing are all needed too. The teacher in our Montessori environments plans activities for each individual child where they can practice these skills. Activities may include buttoning, the pink tower, clapping games and activities designed for the individual child. How individual children learn, a child’s particular interests and experiences are all used to provide appropriate activities and opportunities for the children in our rich environments. If all this is taken into consideration it will provide a long term foundation and ensure a deeper understanding and sustained learning for the child. With so many distractions in today’s world, particularly from various screens even in our youngest children, it is important that whatever we do to encourage literacy is not only appealing to the child, but is fun. These are a few of the methods we use at The Children’s House in Overton and Steventon. Reading to the children. In my early days as a Montessori teacher there was a child who just was not accessing any of the literacy activities and I could not understand why. I tried to draw him in using some of his favourite television characters, but with limited success. It was only when I spoke to the parents and found that they ‘never had time to read themselves let alone their child’, that I began to understand. Shortly after the parents made a real effort and started reading to their son at bed time. By the time he left us he enjoyed spending time in our book corner and was even accessing some our word building activities. We read to the children throughout the day, either on a one to one or to a large group. Parents and grandparents come in regularly to read to the children too, which everyone enjoys and often gives the son/daughter/grandchild something to look forward to. If you read books you enjoy this enjoyment is conveyed to the child. The children love choosing books from the mobile library that comes to Steventon and we take the children to the library in Overton too. Role models: This can be from older children, being seen reading and enjoying books, writing and using appropriate language as well as adults. We don’t’ segregate children by their age, enabling the younger children to learn from the older children and the older children are able to support the younger children. This is what Montessori referred to as ‘vertical grouping’. If a child sees those he looks up to enjoying reading, it may be something they will try to do too. The language adults’ use is vital too. Using the correct terminology and rich language, providing opportunities for children to be listened to, modelling sentence structure, using open ended questioning and sustained shared thinking are all methods to help a child. Never underestimate the capabilities of any child. You will be amazed at what they will absorb and often throw back at you and in the appropriate context at a later date. 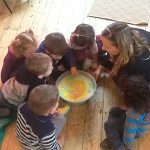 “The children benefit from the exemplary role models of the whole staff team; the adults’ use of language and narration of the experiences on offer mean that the children are exposed to a rich language environment and staff expertly engage the children in sustained shared thinking”. Providing lots of opportunities for mark making. Large areas where they can use their gross motor skills to draw anything from large circles to representations of a recent experience. It can be painting with water on the outside wall or making patterns with chalk on the patio. Gradually the child will move onto using smaller areas like drawing in the sand and using a variety of media and mark making materials before they move onto using pencils and making patterns with our insets. Our insets not only provide an opportunity to practice their fine motor and pencil control, but shape recognition and creativity are enhanced too. Providing multi-sensory experiences to assist the child to absorb the shapes and sounds of the letters. The child hears the sounds, feels the sounds using the sandpaper letters and sees the sounds written down. 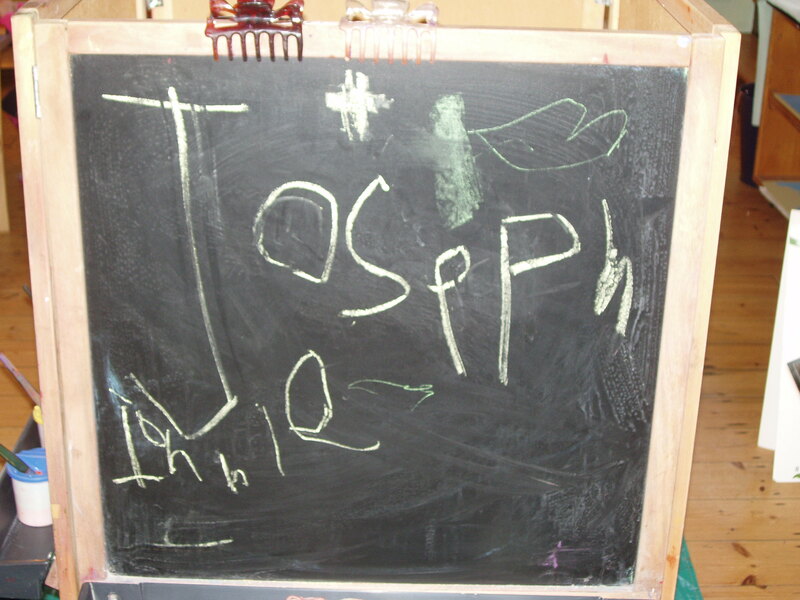 The children often enjoy making rubbings of letters with crayons, writing letters in the sand and matching them. Montessori schools have always used phonics to assist the child from first hearing the sounds, to word building, word lists, reading phrases, then sentences and books. Always at the child’s pace, adding steps or removing steps as the child needs. I hope the above provides a taste of how we encourage literacy at The Children’s House. Please feel free to ask me, Marianne, any questions or come and see us at Steventon or St. Luke’s Hall in Overton.